Archos keeps cranking out the portable video players (PVPs). The latest, the $500 AV500 Mobile DVR, has roughly the same compact form factor as Creative's slightly sleeker Zen Vision but manages to squeeze in a roomy wide-screen LCD. When you add its 30GB hard drive (or whopping 100GB drive in the $700 model), unsurpassed video-recording features, terrific battery life, and all the amenities of a good audio player and photo viewer, the AV500 looks like a surefire PVP champ. However, before you pull out your credit card, keep in mind that getting video on to the device is a lot more complicated and time-consuming than with iTunes and the new iPod. Indeed, the AV500 is best suited to tech-savvy users who have patience for its manual, VCR-like recording process. But for that crowd, this is one awesome traveling companion. With its brushed-metal exterior, sharp corners, and engraved silver buttons, the Archos AV500 has a decidedly industrial look, and the casing is durable and well put together. Whether you prefer that to the more elegant design of, say, the Creative Zen Vision is largely a matter of personal preference. We like the look well enough, but we think its odd, Tetris-like controls hurt the aesthetic. The 30GB Archos AV500 Mobile DVR next to the 30GB Creative Zen Vision. The Archos AV500 weighs 9 ounces and measures 3 by 4.9 by 0.7 inches, meaning you can pocket it with only a bit more bulge than you'd get from a full-size PDA. It's actually a tad big to be carrying around like you would an MP3 player, though. The real news is the 4-inch wide-screen LCD, which provides quite a bit more viewing area than the Zen Vision's smaller 4:3 display. However, the latter's 640x480-pixel resolution trumps the AV500's 480x272. But does pixel count really matter in a device this small? Skip ahead to the Performance section to find out. Along the top of the Archos AV500, you'll find a TV/LCD button, which toggles video output; a USB A port for connecting digital cameras and compatible accessories; a USB B port for connecting to a computer; a DC-in jack; and a multiconnect jack for headphones, A/V connections, and remotes, including an optional FM tuner/recorder. Sorely missing from the device is a kickstand. While watching video, you'll have to hold the AV500 at a comfortable viewing angle or find something to prop it against. On the plus side, the battery is removable, so at least you can stock a spare (coming soon, price to be determined) for long trips. Operating the Archos AV500 is relatively simple, thanks to its lovely icon-driven interface, though the controls aren't immediately intuitive. The D-pad is easy enough to figure out, but what about the two extra buttons in either corner? (They're for rapid scrolling through lengthy song lists.) Equally mysterious, at least initially, are the four buttons below the D-pad. They're used with context-sensitive Action menus that appear in the neighboring corner of the screen. Ultimately, there's nothing complicated about using the AV500, especially after you learn the controls, but the lack of meaningful button labels creates unnecessary confusion. To simplify the connection of the AV500 to your TV or home stereo, Archos supplies a TV docking pod. This disc-shaped unit provides A/V-in, A/V-out, S-Video-in, power, and IR-blaster ports, the last of which is used for attaching an included sensor to your VCR or cable/satellite box. However, the dock doesn't cradle the AV500, and its curved top makes a poor platform for the unit. Cowon's new A2 PVP also records video but doesn't require the A/V breakout pod. Whether or not the dock is connected, you can control the AV500 via the included full-size remote, which seems almost comically large compared with the AV500 itself. The AV500 with its bundled full-size remote control and A/V docking pod. Archos will soon release the $200 Mini-Cam, a lipstick-shaped video camera that plugs into the AV500's main A/V socket. 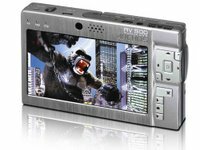 The camera's cable has an in-line remote control for easy MPEG-4 recording and a built-in microphone; the camera itself is mountable. The Mini-Cam, despite its cost, is way cool; it can be used in a variety of situations, such as extreme sporting activities. In terms of sharpness and low-light performance, video quality on this color CCD camera is decent too. Following in the feature-rich footsteps of the Archos AV700 and the Archos AV420, the Archos AV500 performs a remarkable number of tasks. 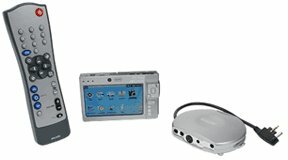 It's an audio player and a recorder; a video player and a recorder; a voice recorder; a photo viewer; and a portable hard drive. And like its aforementioned predecessors, the AV500 has the enviable ability to record TV shows at scheduled times, something few other PVPs can do. However, this no longer seems like such a coup. Now that Apple's iTunes store has made a small but decent selection of TV shows and music videos available for point-and-click viewing on the latest iPod, it seems frustrating to have to jump through so many hoops with the Archos AV500. First, there's the initial task of integrating the TV docking pod with your entertainment system--a complicated endeavor if there's a cable or satellite box involved. Next, you have to schedule recordings using the AV500's awkward, VCR-like onscreen menu or a convoluted My Yahoo TV calendar download. Finally, you have to wait for the scheduled recording to finish--no instant gratification here. Admittedly, iTunes offers an extremely limited TV selection at the moment, and the shows aren't free. With the Archos AV500, you can stock up on whatever you like and not pay an extra cent. Plus, you get to view your shows on a relatively giant screen. But it's hard not to feel wistful about the speed and simplicity of the iTunes/iPod solution. The AV500 is Archos's fifth PVP with scheduled-recording capabilities, but the company hasn't made any meaningful improvements. Where's the built-in TV guide for show-based scheduling? Where's the option to set up recurring recordings à la TiVo's Season Pass or even a typical VCR? Speaking of TiVo, how about playback support for that device, a feature offered by Creative's Zen Vision? Make no mistake: The AV500 still beats most of the competition when it comes to video features, but suddenly it seems a lot less convenient. The Archos AV500 isn't completely without online content options. Its support for PlaysForSure means you can play songs purchased or rented from any number of online services, ranging from BuyMusic to Yahoo Music Unlimited. But PlaysForSure also encompasses video, meaning that someday you may be able to choose from a wide variety of TV and movie downloads. For now, however, the choices are insultingly limited: a handful of TV clips from MSN Video and a small library of D-grade movies from CinemaNow. Until these services wake up and smell the iTunes, your best bet for getting movies on to the Archos AV500 is copying them from a DVD player. And luckily, since Archos is Macrovision compliant, you can record copy-protected DVDs directly to the AV500. Playback is limited to the AV500 itself--unlike with other video content, which can be viewed on an external TV--but at least you get to take advantage of the wide screen, something that can't be said of most recorded TV. Unless you're starting with wide-screen content, some of the AV500's screen estate goes to waste. Before connecting the Archos AV500 to your PC, you need to decide what mode to put it in: Hard Drive or Windows Device. True to its name, the former enables drag-and-drop file management, effectively turning the AV500 into an external hard drive. In Windows Device mode, you must use Windows Media Player 10, which allows you to autosync audio and video and take advantage of PlaysForSure content. We're not wild about the hassle of having to switch modes, depending on what you want to do. It's worth noting that to access any of the bundled software--which consists primarily of the freeware video-conversion utility VirtualDub and the Archos front-end MPEG-4 Translator--you'll have to put the AV500 in Hard Drive mode. Archos doesn't supply a software CD; everything comes on the device's drive, except the necessary DivX codec, which you'll have to find and download yourself. Curiously, Archos also supplies Windows Media Player 9, even though the manual focuses primarily on version 10 and autosync requires it. After installing VirtualDub and MPEG-4 Translator, you'll use the latter to set up AVI and MPEG-1 conversions; MPEG-2 isn't supported, alas. It's an easy program to work with, except that it doesn't list the AV500 as a potential target device--only older Archos models. If you choose Archos Default as suggested in the manual, the default LCD output resolution doesn't take full advantage of the available screen resolution. You'll have to fiddle with the settings manually. Once you're actually playing video on the Archos AV500 or an external TV, you can adjust the aspect ratio using any of these three settings: Auto, Maximized, or Full Picture. There's also a slow-motion mode with three speed settings, as well as a bookmark option. Don't worry if you forget to set a bookmark; the main menu features a handy Resume option that automatically returns you to wherever you left off. Basically, once you have playable video on the AV500, the device and its software are a true joy to use. From the beefy and responsive processor to the convenient soft keys, it's obvious that Archos is an experienced portable video company. As an audio player, the Archos AV500 covers all the bases: MP3; protected WMA, including subscription content; and WAV, which is also the format used for audio recordings. Mac users can leverage the included iTunes plug-in though not for songs purchased from the service; the AAC format isn't supported. The Archos AV500 provides all the typical playback and library options, plus on-device playlist creation and support for album art. Indeed, the player takes full advantage of the AV700's big screen, splashing album art across nearly a third of it and using the remaining space for track info: name, artist, album, bit rate, playback time (remaining, elapsed, and total), and so on. It even displays the name of the next queued track. Surprisingly, the player lacks an equalizer, leaving you with little more than treble, bass, and bass-boost sliders. It's also frustrating that you can't multitask; viewing photos while listening to music isn't an option. Sifting through lengthy song lists is made somewhat easier by the Archos AV500's accelerate-up and accelerate-down buttons, which reside at the corners of the four-way D-pad--but they're a far cry from, say, an iPod scrollwheel. You can press either of them once to scroll a page at a time and hold them down to accelerate through the list. There's not much to say about the Archos AV500's photo features, which don't extend much beyond basic slide-show capabilities. If you remember to pack both the USB cable for your camera (or a USB memory-card reader) and the adapter cable for the AV500, you can download and view photos--a handy remedy for overfilled memory cards. The AV500 displays only JPEG and BMP images, though it can still download other file types, such as TIFF and raw. Viewed in a vacuum, the Archos AV500's screen looks quite good. It's bright and reasonably colorful, with an appreciably wide viewing angle. At no point while watching our sample videos did we find fault with them--until we put the AV500 alongside the Creative Zen Vision. The latter's screen has roughly 50 percent more pixels and exhibits noticeably sharper images and warmer, more accurate colors; however, the Zen Vision's mediocre viewing angle makes up for the AV500's lack of pixels. Although you'll likely be satisfied with the AV500's image quality, you can definitely do better. You'll also want to stay indoors, as screen brightness takes a major hit when you venture outside. Connecting the Archos AV500 to a TV yields good results, particularly when playing back high-resolution video files. It's capable of 720x480-pixel output, which is on a par with high-definition TV. Ironically, however, because it's limited to 640x480 recording, there's no easy way to fully leverage its maximum output resolution. The Archos AV500's built-in speaker produces weak volume levels, so don't plan on using the unit for your next party unless you connect some powered speakers. As usual, Archos supplies a pair of uncomfortable though decent-sounding earbuds. The in-line volume control is nice, but users should plan on plugging in their favorite headphones instead. The Archos AV500 boots up in just a few seconds and snaps between menus with no noticeable delay. It's also relatively speedy at file transfers, though its lab score of 5.82MB per second could best be described as average. Thankfully, there's nothing average about its exemplary battery life: 8.2 hours for video and 21.1 hours for audio. Those are really impressive numbers for a device with such a big screen. The good: The Archos AV500 has a nice wide-screen LCD with great viewing angles yet is compact enough to fit in a pocket. It supports PlaysForSure audio and video and has superb audio quality, and with it, you can record audio and video from external sources, including TV at scheduled times. The AV500 also has excellent battery life and a good printed manual, and with the included plug-in, it will work within iTunes. The bad: The Archos AV500 is one pricey beast, and the controls can take a little getting used to. We don't like the fact that you can't multitask and that it lacks a kickstand or carrying case. Although audio quality is top-notch, there is no equalizer, and the earbuds are uncomfortable. Also, it doesn't have an iTunes-like source for video downloads, though it does record video. The bottom line: The well-appointed Archos AV500 puts wide-screen video in your pocket, but we're still waiting for a point-and-click way to get video into the device.